We continue our trek through the production of Damnation’s Hammer’s latest album: did all that pre-production effort pay dividends in the studio? In Part 1, I described the painstaking pre-production work for Unseen Planets, Deadly Spheres, a modern metal album by Damnation’s Hammer, which aimed to ensure that the songs and performances were absolutely studio-ready. This time around, I want to take you through the recording sessions themselves. We’d re-headed, re-tuned and damped the drums prior to the last rehearsal before the recording sessions. As well as allowing the heads to bed in, this avoided wasting studio time. The kit was dropped off the day before the first session, to allow the shells and heads time to adjust to the studio’s humidity and temperature. But before setting up the drums, I wanted to find the best spot for them in the live room. The controlled, bright sound we wanted is seldom found in the centre of a room, so I hit a floor tom as I walked around to get a sense of how various positions emphasised or attenuated certain frequencies. Having found a pleasing location, I placed the snare drum there and erected the rest of the kit around it. Finding the best spot is only half the battle, though. 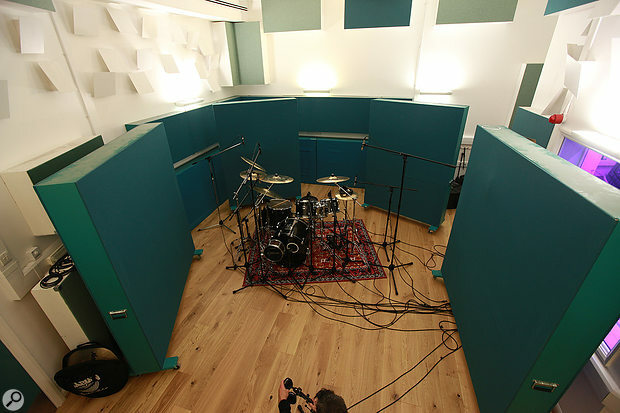 Typically, drums react differently in the studio than where the tuning and damping took place; the more controlled studio acoustics quickly reveal drums that sound choked or sustain excessively. So my next task was to assess the kit’s tuning and interaction with the room via a spaced pair of overhead mics. I placed these approximately two and a half feet above the cymbals, roughly above the hats and ride; this setup wasn’t used for the actual tracking, but it painted a broad initial picture of how the kit would translate when recorded. Monitoring this array in the control room whilst drummer Gary played, I could hear the snare ring undesirably and too much sustain for the faster patterns we’d be recording, and there was an unwelcome ‘growl’ from two of the toms. Tuning the snare’s batter head down slightly and tightening the offending toms’ resonant heads resolved these problems, and this was far easier to do with no spot mics in place! Metal music demands particularly consistent kick hits, with minimal or no dynamic variation, other than perhaps during quieter sections. As the kick is always struck in the same place, it’s already more consistent than other drums, and thus the easiest component to reinforce/replace successfully with samples. 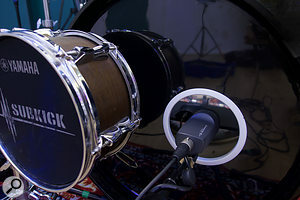 All the same, recording high-quality kick sounds is good, basic recording practice: whatever your post-production plans, good recordings are important to your reputation should anyone access your session files in the future; drummers know their sounds and performances have been properly captured; and it provides a stronger, more inspiring foundation when tracking overdubs. 1. 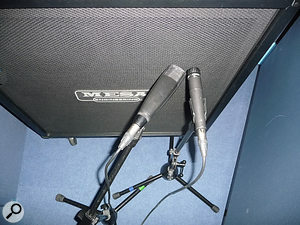 Three-mic Kick Trick, featuring a Yamaha Subkick outside the resonant head; a Sennheiser e602 placed half-in/half-out of the port; and a Sennheiser e901 (see picture 2) as an internal ‘attack’ mic. 2. 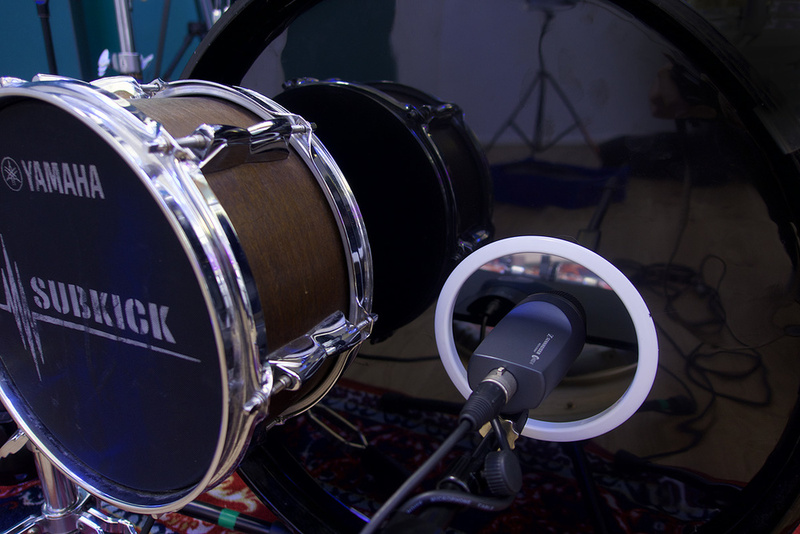 A Sennheiser e901 ‘attack’ mic placed on some strong corrugated card secured horizontally across the kick drum around a third of the drum’s height. The cartridge is about six inches below the batter head contact area.For these sessions, I used a three-mic approach (see pictures 1 and 2): a Yamaha Subkick outside the resonant head; a Sennheiser e602 placed half-in/half-out of the port; and a Sennheiser e901 as an internal ‘attack’ mic, roughly six-inches from the batter head contact point (this last mic was positioned on a piece of reinforced cardboard suspended inside the kick shell). Three mics may seem excessive, but this approach ensures not only that the source is well captured, but that you have useful, easy control when mixing. For instance, different subdivision speeds can often be better conveyed simply by adjusting the balance of the three mics. No one mic was intended to give me the whole kick sound on its own, though, so while I took time to make sure they were phase-coherent (using the porthole mic as the reference ‘anchor’), and that the overall sound was good, I wasn’t especially concerned with how each mic sounded in isolation. My default snare top-mic placement typically has the mic’s diaphragm directly above the batter head, aiming broadly at the contact point or far rim, at perhaps an inch to two from both rim and head — and between the lugs, rather than next to them, as I find this captures more pleasing overtones. For most drum sessions, I also experiment with another placement, further away from the centre of the drum, just off the rim. This can capitalise on the hard, dense-sounding content radiating from the snare rim and the edge of the batter head. But with the heavy hat-hitting in this project, I was concerned about the level of hi-hat spill with this technique, so I stuck with my default approach — though I placed the SM57 closer to the batter head than usual, to enhance the low end and slightly improve the ratio of hat-spill to snare. Another (polarity-inverted) SM57 was used beneath the snare, placed directly below the top mic and aiming directly at the snare wires from roughly three inches away. I didn’t look to reinvent the wheel when it came to miking the toms, either. I assigned each a Sennheiser MD421 dynamic mic, its end-firing capsule directly over the batter head and between, rather than above, the lugs. They were roughly an inch away from both the rim and head with smaller toms (see picture 3), and perhaps two inches away from the rim and head of the lowest floor tom, with each aiming at the batter head contact point. With sufficient mics, preamps and inputs available, I love to mic toms’ resonant heads, but it wasn’t necessary here; with the warm-sounding, resonant Yamaha oak shells, I was happy with the sound of the batter head mics alone. 3. The tom and snare-top mic placement. 4. Neumann KM184 mics used on the crashes, placed in such a way that the cymbals prevented some of the hat’s and snare’s high frequencies reaching the mic directly.The hi-hat and cymbal sounds are critically important to all metal records: they deliver the subdivisions of the beats and patterns, and contribute substantially to the music’s drive and energy. But reinforcement or replacement, while commonplace for other kit pieces, is not viable, so the selection and placement of metalwork mics is crucial. For the hi-hat, I initially put a Neumann KM184 small-diaphragm capacitor mic four inches from the hat, at the furthest point possible from the centre of the snare, and aiming at the mid-point between the edge of the bell and the edge of the hat. This way, the hats blocked the mic’s ‘view’ of the snare, preventing some of the snare’s high frequencies reaching the mic directly. As the hats were being struck so hard, though, I had to increase this mic’s distance from the hat slightly to tackle the thick/clunky sound. 5. The nearest Neumann KM184 is used for paired cymbal miking, positioned to ensure that the nearest crash and large china next to it are as evenly balanced as possible. 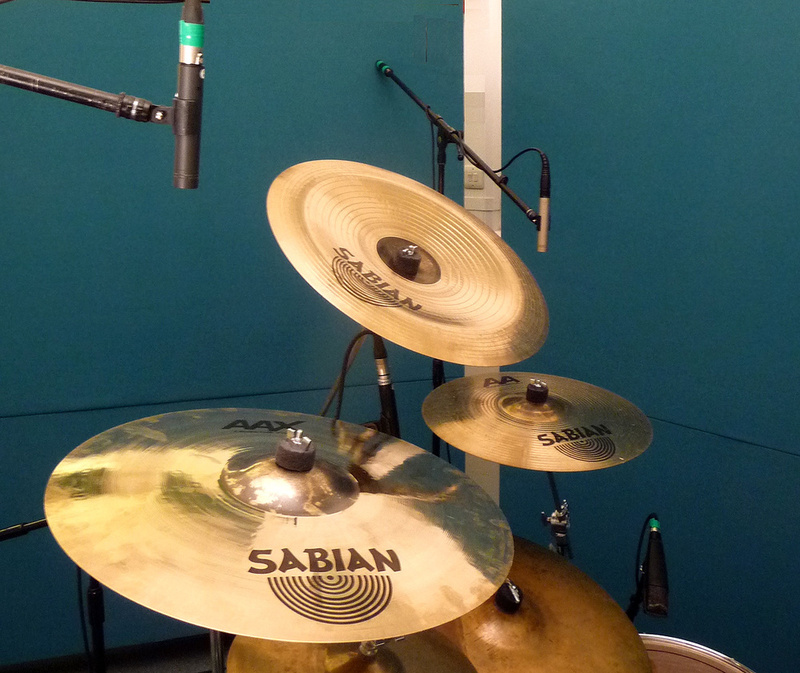 The furthest crash cymbal has been allocated an individual cymbal mic.To give plenty of control over the crashes, I’d reserved inputs for both individual and paired miking options, again using Neumann KM184s. For better isolation, I placed each mic at the furthest cymbal side from the snare and hi-hat, while also trying to find a position in which the cymbal obscured the some of the high frequencies of the hats and snare (picture 4). 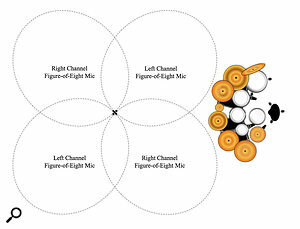 The paired cymbal miking involved placing each mic in the centre of a pair of adjacent cymbals, with small adjustments to ensure the cymbal levels were evenly balanced (picture 5). Last (but far from least), I set up a Blumlein pair, which is my favourite technique for drum stereo room/ambient mics. This comprised a pair of Coles 4038 figure-of-eight ribbon mics with their side nulls rejecting some of the direct drum sound, and set up at slightly below knee height to minimise the amount of cymbal wash (picture 6). 6. 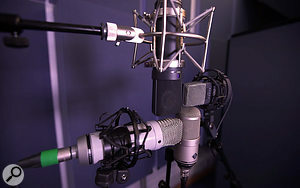 The Coles figure-of-eight ribbon mics were set up as a Blumlein pair, in a relatively low position that kept the cymbal wash down in the balance.Room mics offer a radical alter ego to the isolated, heavily sculpted spot mics and drum samples typically required for metal productions; they can provide a controllable form of ‘glue’ at the mix stage, and a valuable sense of cohesion that’s hard to achieve with close mics alone. I was certain the Blumlein pair would be treated with quite radical compression in the mix, both to emphasise the ambience and introduce some harmonic distortion. With this in mind, these were the only drum signals I ‘printed’ with compression and analogue processing, which came courtesy of my Empirical Labs EL7X Fatso, set so that with its ‘warmth’ mode engaged it applied up to about 12dB (max) of gain reduction. After a few minor drum-tuning and mic-position tweaks, and gain adjustments on the Audient ASP8024 HE console’s preamps, we were ready to track. Before recording the songs, though, I captured some clean hits from the kit, which would later allow me to create samples to reinforce the performance — see ‘Sampling The Session Drum Kit’ box for details. Having taken care of that it took a good few takes for Gary to settle in. Once he was in the zone, though, it quickly became obvious that using drop-ins and tracking in sections was breaking his natural flow and his ability to lock to the click. His performances were more accurate when playing through the whole arrangement, so I decided to work with whole-arrangement takes: selective comping of such takes is almost always a better and quicker route to good drum tracks than detailed corrective editing. Before moving to the next song, I just had to make sure that everything I needed for the comped performance was captured in the Pro Tools playlists. 7. The final drum-tracking mic placements. In most of the genres where overdubs are commonplace, bass is usually tracked second (after the drums), because the rhythm section provides such a solid foundation for everything else. The pitch challenges of down-tuned metal, though, mean it’s often better to track the guitars before the bass. With the diads, triads and full chords in rhythm guitar performances, it’s easier to judge whether certain strings are tuned and played at the correct pitch, especially the thickest string, which is often the most problematic. It’s also far easier to tune a single bass part accurately relative to two (double-tracked) or four (quad-tracked) guitars than the other way around! As discussed in part one, both guitarists had their distinct rhythm sound, and having witnessed the collective ‘wall of sound’ in rehearsals I knew that capturing/reproducing these tonal characteristics would be important. 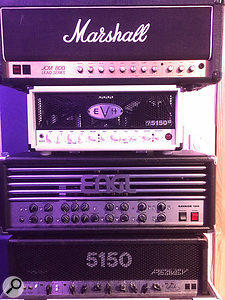 After asking guitarist Tim to dial in his preferred sound in the live space (with a trusted ’57 half-on/half-off the dust cap, an inch from the grill cloth on one of the 4x12 cab’s upper speakers) I considered how well his Peavey 6505 plus Mesa 4x12 rig translated via close-miking. It was clear that although his rig’s low end worked for gigs and rehearsals it sounded nowhere near tight and controlled enough under the studio-monitor ‘microscope’; it sounded somewhat muddy and the note attacks were rather indistinct. This was partly due to excessive distortion having been dialled in (see the 'Dial Back That Distortion!' box), but despite tonal tweaks and gain adjustments, the rhythm sound still lacked the hard note attack required for the fast riff rhythm structures. Guitar speakers colour the sound in a non-linear, unpredictable way. Even speakers of the same brand and model in the same position in the same cab can sound different. This can be further influenced by the speaker’s position in the cabinet, particularly with angled cabinets. For recording purposes, it’s well worth establishing which of a cab’s speakers sound best. Placing your head close to the speakers is a rather hit-and-miss auditioning approach — I prefer to reamp a representative performance using two SM57s in the same region of the two upper speakers in the cab, then rotate the cab 180 degrees (flip it vertically) to capture the other two speakers with the same mics. Having found the best speaker, I surrounded the cab with isolating baffles to minimise the room ambience at the mic, as it tends to soften this style of rhythm sound. I carried out further reamp tests to find the optimum amp master volume (an often-overlooked but very influential factor), and to make this easier, I placed the amp head in the control room, with long cables connecting it to the cab in the live space. After auditioning numerous level-matched recordings and finding the most effective amp level, I made a few tonal adjustments to the amp. 8. 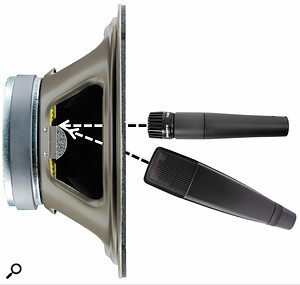 The dual-mic technique used on guitar cabs, with phase-aligned SM57 and MD421 dynamic mics.A cab-miking mic technique I’ve relied on for several years involves an on-axis SM57 or MD421 half-on/half-off the dust cap, accompanied by a moderately off-axis MD421 or SM57 (whichever wasn’t used in the other position) at the other side of the dust cap (see picture 8). For Tim’s rhythm sound, I used an SM57 on-axis, and increased its distance from the source slightly to tighten the lows somewhat. After introducing the MD421 and ensuring a perfect phase relationship between the mics (inverting the polarity of the MD421, then adjusting its distance from the speaker until the combined impact of both mics was as small as possible, before ‘un-inverting’ the polarity) we were very close indeed to the desired sound. The only issue was a touch of high-frequency ‘abrasion’ — the final setup had the MD421 slightly further off-axis, the marginally darker sound combining with the SM57 to deliver the sound we sought. Moving to a Mesa 4x12 cab with 25W Celestion Greenback speakers, rather than the Celestion Vintage 30s of the first sound, I set up my dual-diaphragm Audio-Technica AE2500. This mic (picture 9), with its phase-aligned dynamic and condenser capsules in the same housing, is great for rhythm guitars. The dynamic capsule typically doesn’t provide as scooped a sound as the SM57, but it delivers a more forceful low end and moderately less abrasive highs. It sounded lovely with the Greenbacks, and introducing the condenser capsule alongside this, at roughly half the level, yielded a subtle but effective thickening, the combined result delivering strong note definition in the mid-range. 9. 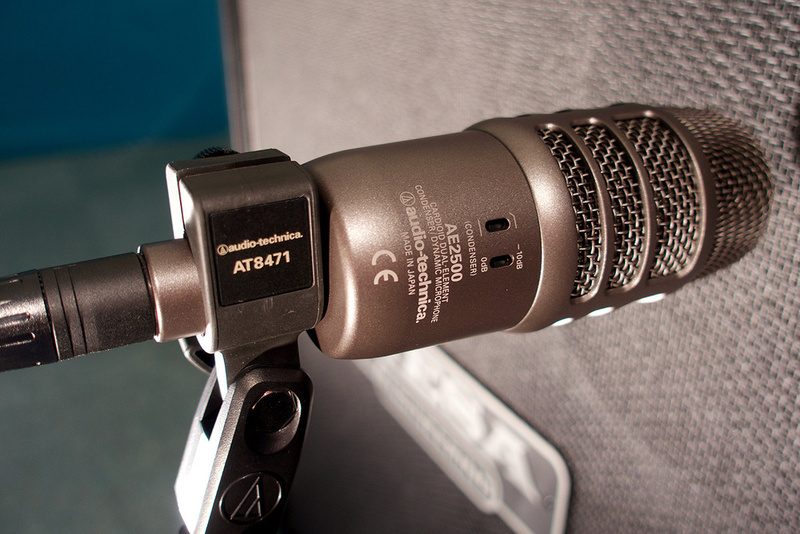 The Audio Technica AE2500 is a dual-diaphragm mic that consists of phase-aligned dynamic and condenser capsules within the same housing.After finding the best speaker in the second cab, surrounding it with isolating baffles, and establishing a mic placement sweet-spot, we auditioned the combination of the two rhythm sounds, via two separate performances. The results unquestionably captured both Tim’s and my visions of the ‘right’ rhythm sound; it was great to see both guitarists so enthused at hearing the riff delivered with the right combination of heaviness and note clarity! With our heavy-yet-clear tone for the rhythm guitars in the left side of our ‘wall of sound’ in the bag, we trained our sights on those for the right. Guitarist Ady’s versatile Laney Ironheart amp could deliver a convincing Van Halen-style ‘brown-sound’, but was less well suited to the band’s down-tuned, riffing style, so we auditioned the MkI and MkIII 5150s, a ‘hot-modded’ Marshall and an Engl Savage 120 (picture 10). To satisfy Ady’s ‘blueprint’ sound (comparatively more mids, moderately less in the lows, somewhat warmer) we felt the MkI 5150 sounded best. The Mesa 4x12/Celestion Vintage 30s and SM57/MD421 combinations we’d used earlier proved just as good with this amp, so this is what we used for the third layer of our quad-tracked sound. 10. The tower of amp candidates!We still needed to differentiate the tonal identity of the two guitarists to create the wide stereo image we craved, though, and to this end the question remained how to track the final of the four rhythm parts. I wanted to avoid using the MkIII 5150 that was the foundation of Tim’s sound, and my Engl Savage 120 amp took us in the direction we wanted to move things, so I resorted to a channel of amp modelling, courtesy of my Line 6 Helix’s Mesa Rectifier model. This did the job: as I write, listening back to a test recording of the four rhythm tones, I feel I managed to capture the tonal identity of each player effectively, and create a seriously wide and heavy sound with strong note definition. It sounds so simple when I write it like that, but the entire process of auditioning amps, cabs, mics and positions had taken almost four hours, and still we’d yet to actually record anything! I seldom print EQ when tracking rhythm guitars; if the tone is lacking, I prefer to alter the guitar/amp/mic preamp settings, or try a different mic or position. But as a safety net I always record a DI, which enables me to reamp if necessary. After setting the levels on the three Unison-enabled Universal Audio Neve 1073 mic-pres I was using, we could begin recording. As Tim had written the album’s guitar riffs, we tracked his parts first. They established the levels of performance tightness required of the other rhythm parts and the bass. We finished the rhythm tracks for each song before moving to the next, but left all the clean parts, overdubs and solos until after the bass had been tracked. I’d comped and edited the drum tracks before we started tracking the guitars, and it was great (both for me and the band members that were present and shared my enthusiasm!) to hear the album begin to take shape. Our extensive pre-production work meant there was immediately a great attitude and vibe from both rhythm performances, and other than a few drop-ins to tighten up certain sections, most of the final rhythm tracks comprised first takes. I’m really pleased with the natural sense of energy this provided; it’s something that can easily get lost after several takes and/or a lot of comping. 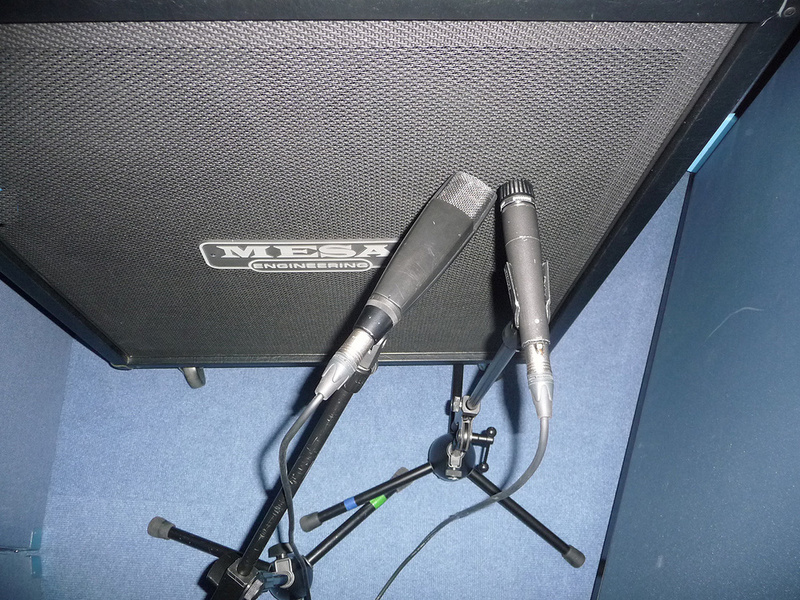 For the clean guitar parts we used the Helix again, before moving on to the overdubs and solos, using the ‘red’ channel on the MkIII 5150 for both. Many of the overdub parts had been written with signal processing (especially expansive multi-tap delays) very much in mind, and I wanted to ensure I’d be able to get the processing spot on in the mix. Tim and Ady had their effects pedals at the ready and would have been perfectly happy to print their effects but instead I chose to apply monitoring effects for the appropriate spatial feel. 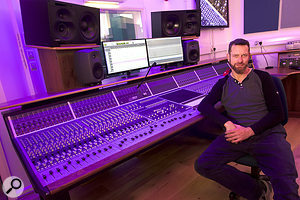 This allowed Tim and Ady’s performances to take account of the feel of the processing, while the dry recorded signal meant I’d have greater control and access to higher-quality effects in the mix. When we’d completed the rhythm guitar tracks for the whole album (re-stringing each guitar three times along the way! ), I sent a rough monitor mix of each song to bassist Jamie, so he could practice before coming to the studio a few days later. He took the opportunity to amend his parts to work with a couple of minor drum/guitar performance-synchronisation adjustments we’d made during tracking. Capturing a DI signal is good engineering practice for any bass recording as it can contribute to the final sound and provides extensive re-amping/processing options. I always take time to assess the merits of a bass DI in isolation, before considering where the thru/link output is to be routed. Without the filtering mechanisms of a bass amp and speakers, a DI signal should cleanly reproduce the fast transient peaks and articulation nuances of a performance, providing a clean and hard-sounding note onset, and a punchy, well-defined tone. A useful analogy for the ideal characteristics of the lowest notes of a down-tuned bass DI is the note definition presented by the same pitches on a piano. On an equal-cost basis, I tend to find that active DI boxes give better results on bass than passive ones — a passive DI can (though won’t necessarily) compromise tonality due to the load placed on the pickup. For these sessions, after Jamie had re-strung his Fender Precision bass, I auditioned it via an active Rupert Neve Designs RNDI. Pleased with both the clean, punchy note definition and the accuracy of the intonation, I routed the thru signal to the amp. As discussed in part one, I sought greater emphasis in the bass sound’s low-mids than its lows, to exploit the part of the spectrum left vacant by the scooped guitars. Despite trying three different bass amps (each through my Ampeg 4x10 cab, miked with an MD421) and experimenting with various settings, the bass just wouldn’t ‘sit’ as required within the wall of guitars; it was either obscuring or getting obscured by the guitars, especially in the low frequencies. I often use a ‘frequency-bracketing’ approach (a combination of high- and low-pass filters, as I’ll discuss in part three) to achieve the desired bass sound when mixing, but as this tactic can sometimes prove ineffective I still wanted to capture an ideal stand-alone amp/cab sound. Fortunately, my Helix modelling unit is far more tweakable than a regular amp/cab/mic signal chain, and it’s as good on bass as it is on guitar. The foundation of the sound on the record was the Helix’s Ampeg SVT bright channel, routed through a RedWirez Ampeg 8x10 impulse response. A Helix parametric-EQ ‘block’ was used to modify the front end before the virtual amp; I could sculpt away until the spectral content of the bass was working really well with the guitars. Probably the most important aspect was adjusting the high-pass filter, to get the bottom end playing nicely with the low end of the guitars. From here I inserted two compressors in series in the Helix’s signal chain, each applying moderate gain reduction. The first was an optical LA-2A-style compressor, with no adjustable attack/release parameters, and this provided RMS-based gain reduction that would broadly reduce the disparity between the quietest and loudest parts of the signal. The second was a modelled FET compressor, with a high threshold, a high ratio and relatively fast attack and release times, to tame the level of high-frequency ‘clank’ from the aggressive fingered-bass performance. I don’t always print compression to a miked bass amp/cab setup (or modelled equivalent) and never do to the DI, but for this style of performance, the compression definitely pushed the sound in the right direction, helping prevent the note attack from appearing ‘disconnected’ from the kick sound, and preventing the note onset of the bass overshadowing that of the guitars. Having nailed the target bass sound, the takes followed very much the same pattern as with the rhythm guitars, with initial takes providing the right energy and aggression and perhaps three/four drop-ins per song refining the performance. It’s worth highlighting just how fast the high-end brightness, attack and clarity of new bass strings diminishes with intensive playing. With Jamie’s aggressive performance style, his bass sound started losing its top-end ‘zing’ around two hours after he’d first re-strung, and this cannot really be compensated for with EQ; dead strings with a high-frequency boost still sound like dead strings! By the time we’d completed the bass parts, we’d re-strung the (most-used) thickest two bass strings twice. Modern metal vocal styles involve considerable performance exertion, requiring equal measures of vocal strength and stamina; it’s rare that vocalists can spend more than three or four hours each day tracking and still maintain the required level of emotional involvement. So I usually spread vocal tracking out over as long a time as possible, preferably interspersing this with the recording of guitars and bass, and scheduling around re-stringing where possible. However, Tim and I had captured a lot of pre-production recordings and were both confident he could record his parts in a single day, so we made a conscious decision to leave the vocals until last. By that time, we figured, the completed bass and guitars tones/performances would provide a strong context for his performances. 12. Clockwise from top, the vocal mics compared via test recordings: Neumann U87, AKG C414 XLS, Neumann M147, Rode NT1A.After working on his headphone mix (which featured a generous level of bass, to help Tim immerse himself in the music), I compared some mics (a Neumann U87, an AKG C414-XLS, a Neumann M147 tube condenser, and a Rode NT1A condenser, as shown in picture 12), each connected to a Unison-enabled Universal Audio Neve 1073 mic preamp. Compensating for level differences, I listened for how full, clear and present each signal appeared in the context of the monitor mix. 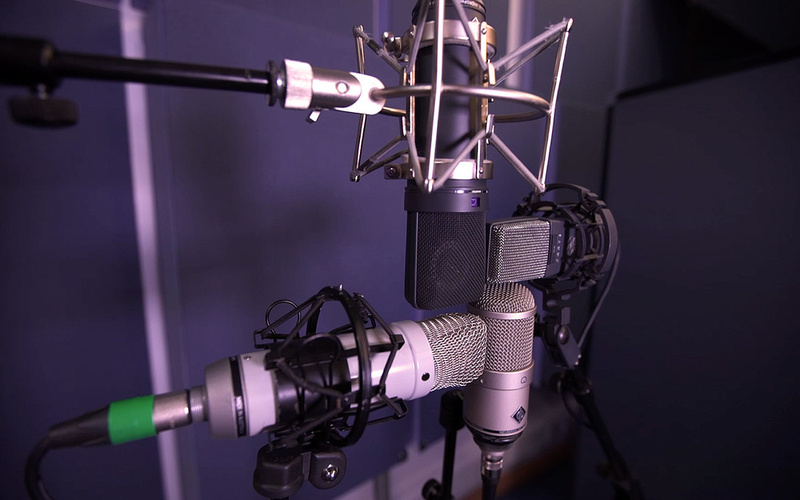 Different mics will work better or worse for different vocalists, so it’s well worth the time taken to conduct comparisons; in this case I preferred the M147, which seemed marginally fuller and, for want of a more technical description, more ‘three dimensional’. For a vocal to sound present in the context of loud distorted guitars, heavy dynamics processing is required, and I’ll often print such processing. As a general printed vocal-compression guide, I suggest starting with a low ratio (around 4:1) with a very fast attack (under 3ms), and a threshold that results in no more than 6-8 dB of gain reduction on the loudest notes. If the compressor has an automatic release setting, this can adapt the gain reduction to the changing dynamics of the performance. Alternatively, set the release with a medium-to-fast setting (somewhere in the region of 100-150 ms is a suitable starting point). 13. Three compressors each performed a slightly different gain-reduction task on vocals.The more experience I’ve gained with vocal compression, though, the more I’ve combined lower thresholds with higher ratios for as much as 15-20 dB gain reduction. With this more assertive processing, more ‘natural’ results can be achieved by sharing the gain-reduction across two or more compressors in series. Here, a Warm Audio WA-2A optical compressor was followed by an Empirical Labs EL8X Distressor and, finally, a Warm Audio WA76 (see picture 13). Each delivered a maximum of roughly 6-8 dB gain reduction. The key to getting this combined gain reduction to sound ‘natural’ is discussed in depth in my Metal Music Manual producer interviews (www.mynetaur.com) with Daniel Bergstrand. Essentially, you must set the attack and release settings so that each unit ‘grabs’ and releases the signal at different times. While the optical WA-2A is highly effective for vocal compression, its fixed attack time (averaging around 10ms) means it can over-accentuate initial syllables. The ‘zero-attack’ and fast release of the Distressor was intended to smooth these emphasised syllables, and the fast-attacking WA76 further restrained the vocal dynamics, in a manner that complemented the previous two compressors. Listening to a test recording in the context of the mix assured me I’d not gone too far with the compression. The signal sounded sufficiently up-front, but without the vocal sounding overly processed, and without unnatural gain-reduction modulations being evident. If a vocalist is content to record without effects processing, it usually results in the most pitch-accurate performance, but as Tim felt a hint of effects would improve the ‘vibe’ of his cue mix I added some delay via an aux return; I find that the separation of delay repeats is less likely to overshadow an artist’s tonal delivery than a denser wash of reverb. To prevent this effect compromising his timing and rhythmic feel, I restricted the monitoring level of the delay and avoided long feedback values. Effective coaching is often essential in bringing out the right performance energy, power and conviction in a vocal performance, but sometimes a greater focus on timing, clarity and intelligibility is required. For this session, energy, power and conviction were in plentiful supply, and the recordings generally consisted of two whole-song takes, from which the best sections were later comped. The only comments I needed to provide during this process related to timing and lyrical intelligibility (a good metal producer ensures as much comprehensible lyrical content as possible is captured). We managed to complete the vocal recordings, including comping the takes, in just five hours. I wrapped things up by running off rough vocal-up monitor mixes for Tim to check before we started mixing. Although these recording sessions comprised 10 full days in total, they weren’t 10 consecutive days. The drum performance playlists were comped together over a couple of days, prior to starting the rhythm guitars. Jamie had a few days practicing to the final drum and rhythm guitars before tracking his bass. And the two or three days available after the drums/guitars/bass and overdubs/cleans/solos sessions allowed me to create a rough but powerful mix to provide an inspiring headphone mix for vocal recording. This approach gave us a firmer foundation for each subsequent recording session, whilst enabling each artist tracking preparation/practice time for their final performances. With the recording stage concluded, and the sounds and performances captured to the standard we’d hoped for, I was eager to crack on with the editing, mixing and mastering — all of which I’ll cover next time. Mark Mynett is a producer and recording/mixing/mastering engineer, Senior Lecturer in Music Technology and Production at Huddersfield University, and author of Metal Music Manual: Producing, Engineering, Mixing and Mastering Contemporary Heavy Music. Readers of SOS are eligible for a 20-percent discount for online orders of Metal Music Manual — just follow the link below and enter the code FLR40 at the checkout. There are numerous benefits to recording clean hits from the kit to be used for tracking. A clear, isolated tuning reference is captured, allowing shell tunings to be more easily matched up after re-heading mid-way through a session. Additionally, if a high standard of drum performance has been recorded, but with the notable exception of, for example, a cymbal or tom hit being missed during a complex fill, the missing strike can simply be flown in from the clean hits multitrack. The alternative solutions can be limited, time-consuming or less than ideal. There are two overarching approaches to recording clean drum hits. The first uses the mic placements already established for the recording, with the clean hits taken before tracking commences. This provides the advantage of the less-blemished drumheads and initial tuning, with a subsequent reference to this tuning being available in the event that re-heading is required. A second tactic involves hits taken after the drums have been tracked. 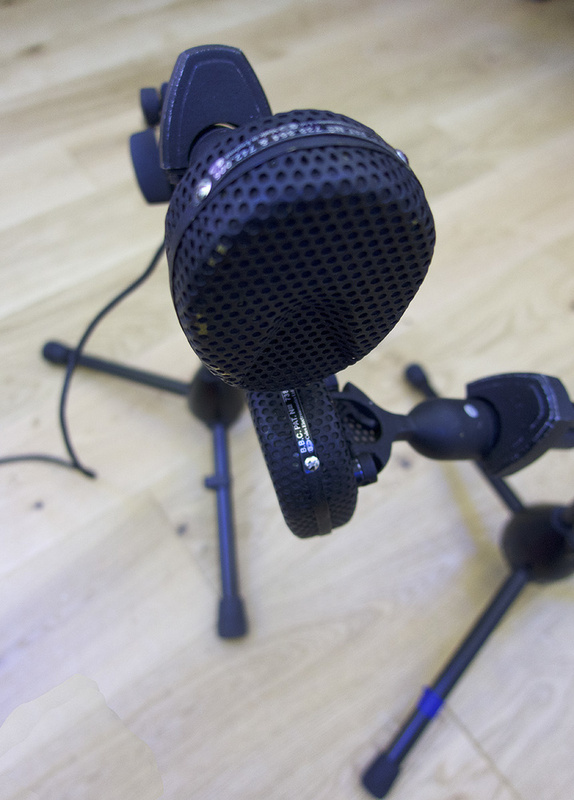 Whereas mic placements for tracking drums are informed partly by spill rejection, when recording clean hits, you can focus solely on sound quality — since you’re playing one kit piece at a time there’s no spill to contend with. For example, when recording clean snare hits, a condenser mic could be placed a foot and a half directly above the snare; a position normally invalidated by the inevitable spill. 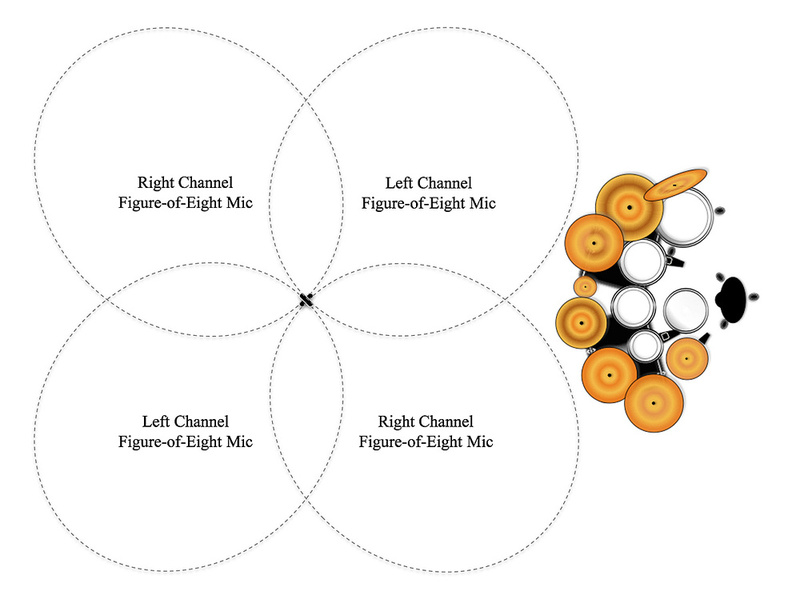 Similarly, you have more inputs available: three or more spot mics could be used to capture clean kick hits, even if you had insufficient inputs available when tracking the main performance. With either approach, each clean hit should be recorded across every open mic in the recording space, allowing samples to be created from the most effective combinations. The most important aspect of this process is keeping the hits entirely clean, without sympathetic vibrations from the other drums or cymbals impacting the recorded strike. While recording other kit pieces, the drummer should take the snare wires off the snare drum and rest their free hand on its batter head; other band members can rest their hands or arms on the toms, and hold the cymbals, while each different shell or cymbal is struck. 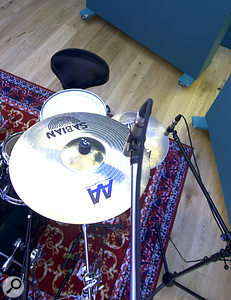 An alternative when recording hits after tracking the performance is to start by recording the clean snare hits, then cymbal hits, then large through to small toms, with each component removed from the recording space after the relevant hits have been recorded — with kick hits captured at the end. Particularly hard clean hits from each shell are essential, and if you’re using software that provides a random multi-samples feature, consider taking several hits at the same velocity, as the timbral variations can result in greater ‘realism’. Be sure to ask for a number of hard rim shots on the snare, and record multi-velocity snare and tom hits. Lastly, just for safety, record clean strikes from each of the cymbals, making sure plenty of decay time has been allowed, and track closed hats as well as open hats, along with different ride hits. 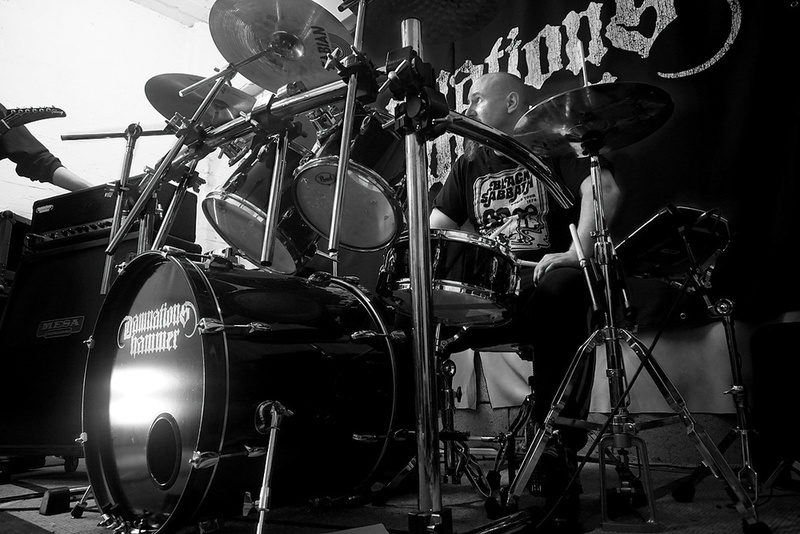 ‘Temple of the Descending Gods’, the opening track of Unseen Planets, Deadly Spheres, can be heard at www.mynetaur.com, and you can also check out the Damnation’s Hammer Bandcamp page at: https://damnationshammer.bandcamp.com. Due to the way gain/distortion translates to a recorded format, restricting the amount of distortion when tracking rhythm guitar for metal music is essential. Compared to guitar cab loudspeakers heard at source, or when further amplified through a PA, lower levels of distortion are required for heavy rhythm guitars to effectively translate via domestic hi-fi speakers/headphones etc. Muddy or fizzy qualities caused by even slightly too much distortion get heightened and accentuated through these playback systems. Excessive distortion also neutralises a guitar’s dynamic content; obscuring the clarity of the notes and rhythmic patterns whilst increasingly obscuring other instruments and sounds. Likewise, a rhythm guitar’s low end tends to become sluggish and droning, and the accompanying disproportionate increase of high frequencies causes a rasping, abrasive timbre. However, it’s about more than the sound — it affects the performance too. By lowering the gain, guitarists tend to adjust by ‘digging-in’ (picking-harder) to achieve the requisite level of ‘bite’. The cleaner, clearer resulting attack and note definition provides a heavier and more naturally aggressive timbre than the ‘fizziness’ that results from lots of distortion and a softer playing style. There are two markedly different approaches to the use of distortion/overdrive pedals for guitar tones in this style of production. The more radical approach relies on these pedals for the overall distortion characteristics of the sound, as well as a significant amount of the tone shaping. This tactic was, and often still is, a favoured approach of many notable Swedish death metal bands. A valve or solid-state amplifier is set with low-to-mid-level distortion characteristics, and an overdrive pedal (usually the Boss HM-2 Heavy Metal pedal, and occasionally the Boss MT-2 Metal Zone) is inserted with all the controls set to full. The pedal, rather than the amp, provides the majority of the distortion. 11. 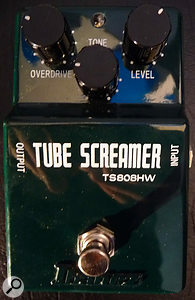 The TS808HW Ibanez Tubescreamer settings used for most rhythm guitar recordings.The other tactic uses a tube amp to deliver the rhythm sound’s overdrive and primary tonal qualities. 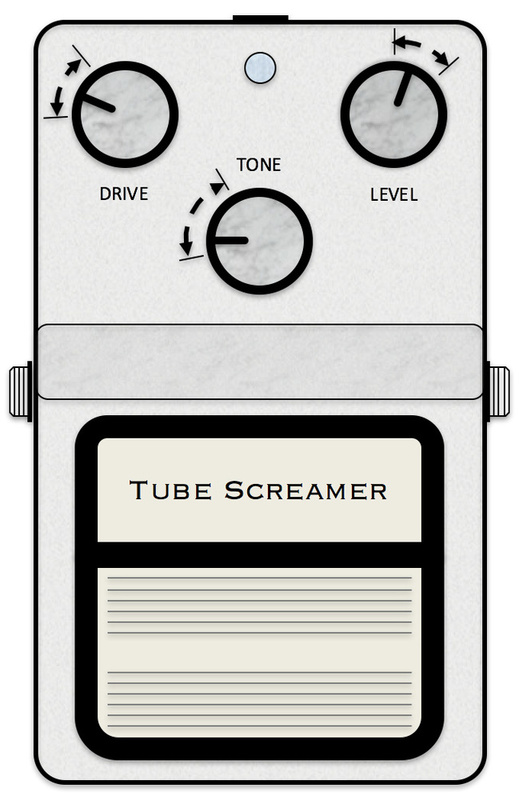 Tubes are generally considered to provide a more musical form of ‘soft clipped’ overdrive. It’s good practice to start by plugging straight into the amp to establish the optimum sound. 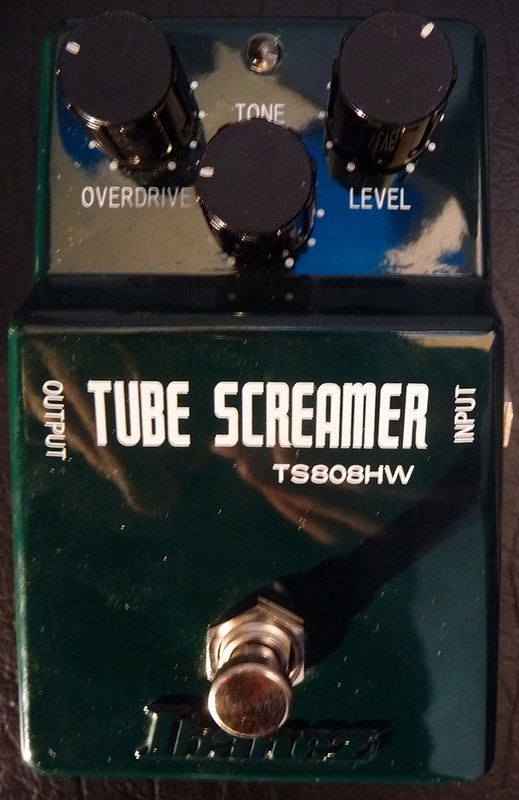 A diode-based Ibanez TS808 Tubescreamer pedal (or equivalent pedal) is then inserted, with its parameters set so there’s no obvious perceptible change in gain, tone or level. 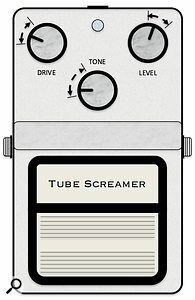 This may sound rather pointless, but Tubescreamers provide various stages of subtle high-pass filtering which modify a guitar signal such that the low-frequency content is tightened — providing a ‘harder’ quality to the low-end. (To highlight this ‘tightening’, audition a riff with palm-muted low notes first with the unit bypassed, then with it engaged). Additionally, the 125-350 Hz region tends to be moderately compressed, and due to a subtle enhancement of the 4-6 kHz presence range, a slight high-frequency ‘thickening’ occurs too. Picture 11 shows ballpark settings for this signal-processing tactic with most guitars. Regardless of the number of guitarists or the number of microphones used, the term ‘double-tracked’ in relation to guitars refers to the process of recording two separate guitar performance takes (often with the aim of opposition-panning the two takes), whereas ‘quad-tracking’ is the process of capturing four separate takes (usually putting two takes on the right, and the other two on the left). Due to the tiny tonal, pitch and timing variances between the different takes, this provides a thickness and width to the sound, and it’s an effect that really can’t (yet, at any rate) be convincingly faked or matched by processing a single take. A producer’s coaching and interpersonal skills are essential when tracking vocals, as physical and emotional considerations have so much more impact on the performance than with other instruments. What this boils down to is ensuring that the vocalist is as physically and psychologically as comfortable as possible — so make sure the heating and lighting in the live space are given consideration, as well as whether the vocalist prefers to sing in the morning, afternoon or evening, and always check which other band members, if any, the vocalist would prefer to be present in the control room. If the vocalist also happens to be the bassist or a guitarist in the band, establish if the familiar feel of playing whilst singing would elicit more vocal energy and emotional conviction, perhaps with their instrument included in their headphone mix.